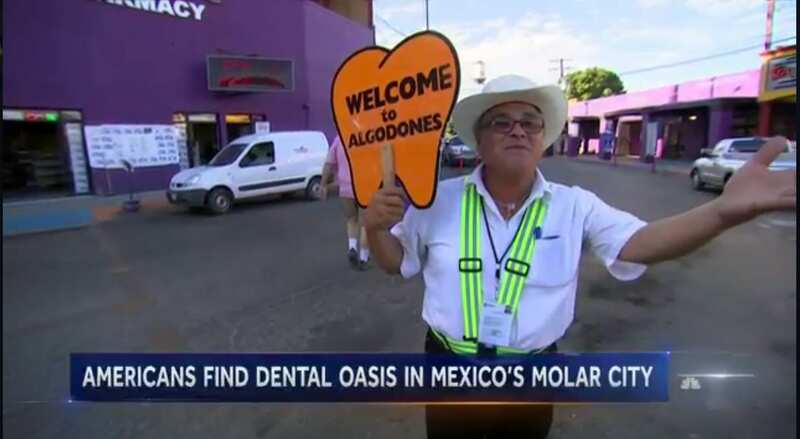 A recent NBC news story highlighted the phenomenon of low-cost dental care in Los Algodones, Mexico, better known to those that live along the Mexican border as Molar City. Up to seven thousand people cross from Yuma Arizona into Los Algodones almost every day during the winter high season to save money on dirt-cheap pharmaceuticals and dental care. Recent reports show that more than 140 Million Americans have no dental insurance, forcing many to forego critical dental care or to seek more affordable care outside of the USA. While many Americans choose Mexico for low-cost dental care, an increasing number of savvy dental patients are choosing Costa Rica as their dental destination. For starters, dental care in Costa Rica is equal and in some respects better and more attentive than the care in the USA and Canada. But the reason that almost every flight to Costa Rica has at least a few dental tourists on board is because of the pricing. While most people correctly surmise that Mexico has low dental prices, many soon discover that dental pricing in Costa Rica is almost equal to the low pricing in Mexico. In fact, a recent patient survey conducted with LosAlgodonesDentalGuide.com and CostaRicaDentalGuide.com reveals that pricing for high quality dental implants in Costa Rica and Los Algodones is very competitive. What makes Costa Rica a better dental destination? We thought we’d ask some patients. Joshua Long, a resident of New York, received 2 dental implants and crowns in Los Algodones almost two years ago. When the time came to choose a clinic to complete his full mouth restoration, Long chose Goodness Dental in Costa Rica. Another factor gleaned during our patient survey that makes Costa Rica a more attractive dental destination is the tourism infrastructure. Los Algodones is a quaint, Mexican border town with more than 300 clinics in a very densely populated area. Patients cross the border on foot or by car. Accommodations are sparse and entertainment is limited. Food options are limited and the weather forecast is always hot with a chance of even hotter. On the upside, the street tacos are amazing! By contrast, a short flight to Costa Rica gives patients access to hundreds of dental clinics in a very cosmopolitan setting, and a tourism infrastructure that is second to none. These clinics are accustomed to caring for American and Canadian patients and are located close to an expansive range of brand and chain hotels and excellent dining options. A nearly perfect climate of 70-80 degrees Fahrenheit, a smorgasbord of entertainment options and a wide variety of tours to explore the rain forest, cloud forest, beaches, waterfalls and more is quickly giving Costa Rica a reputation as a preferred destination for dental tourists from the USA. Patrick Goodness, CEO of Goodness Dental, located in Escazu, an upscale neighborhood in the capital city of San Jose, Costa Rica is convinced that value-conscious Americans will prefer Costa Rica over Los Algodones. Goodness, a Wisconsin native, moved to Costa Rica ten years ago because of Costa Rica’s reputation for quality dental care. He has never looked back. “I have been to Los Algodones many times and we have a great many friends and colleagues there. For patients needing low-cost, basic dental care, Los Algodones is an ideal option. In Los Algodones, a patient can get a crown or fillings for much less than in the USA. However, for patients seeking more complex care like dental implants, all on 4, maxillofacial surgery or a full mouth restoration, Costa Rica may be a better option,” says Goodness. “Our patient process is managed by Dr. Peter Aborn, a recognized NYU-trained prosthodontist, who managed his own highly-rated private practice in New York City for twenty years before relocating to Costa Rica,” says Goodness. Many patients in our survey reported that guarantees were important in their decision-making process. Patients considering dental care outside of the USA should consider that there are both good and not so good dental clinics all over the world. Patients are encouraged to do their research and to seek the best value, not just the lowest possible price. During our research, speaking with more than 118 dental patients for this article, we encountered a few patients that had chosen a dental clinic based on pricing alone. “Low pricing blinds some patients to seeing the flaws in the practice,” said a participating research assistant. Further research revealed that these patients chose clinics with a reputation for “less than stellar” dental care experiences because of perceived price savings. Several of these patients were attracted to package pricing that included dental care and accommodations. These price-focused patients reported post-care complications that cost them additional money to repair back home, adding hundreds or even thousands of dollars to their final cost for care. Conversely, patients that conducted proper research and chose quality dental clinics in Costa Rica with strong ratings and reliable guarantees reported the highest level of patient satisfaction. In all cases of post-care complications, patients reported that they had selected their provider based on pricing alone. For patients seeking affordable dental care outside of the USA, dental destinations such as Los Algodones and Costa Rica offer an abundance of clinics with competitive pricing and varying degrees of quality and reliability. In all cases, patients reported savings of 50% to 70% when compared to pricing for similarly priced dental care in the USA and Canada. As dental prices in North America continue to increase, more and more patients will seek care south of the border. Our advice? Earmark some of your savings for a little vacation and have some fun. It’s called a dental vacation for a reason!